Does Noah know that’s not the Grouch? Even crying he’s adorable. DAAAADDDDDYYYYYY!!! Grover is biting again! No one but Grover is paying ANY attention to me. He looks like a pretty normal baby there, of course he is not happy all the time, but I think you do a good job of keeping him happy most of the time, and you seem to be happy alot too. Good for you! “What? I can’t have pizza yet? Wah!!! hey Grover, when did you grow teeth? Grover is trying to breast feed from me daddy!!!! Daaaaaaaaaaaaad Grover is looking at me! While Grover looked around the grocery store embarrassed, he realized that perhaps he had overestimated his abilities with children. Blaming the fallacy created by his public image, he resolved never to babysit again. I do not want Grover, I want Elmo…..
You may think he’s cute, but to me he’s s-c-a-r-e-y! Who would have thought that Grover had teeth! 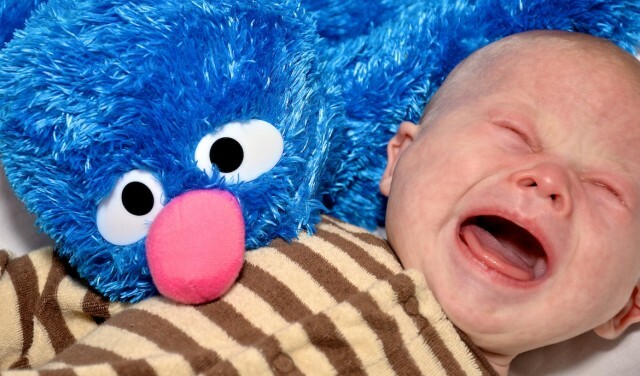 Super Grover’s Evil Twin Tries to Eat Baby! Elmo tickles, but Grover bites! What did that say! Did that say there was a monster under my crib! I am so scared of monsters!!!! Grover and Noah want food and want it now! Daddyyyyyyyyyyy Grover told a lie….he said he was cuter than me!!!!!!! Oh, do not worry Noah. I was only kidding about there being a monster at the end of this book. Why won’t cookie monster share with us Grover? Grover says, “good thing I don’t have ears”. GROVER IS HERE. BUT AM SLEEPY. CANNOT PLAY WITH HIM AND TAKE NAP AT SAME TIME NOOOOOOOOOO!!!!!!!!!!!!!! Please don’t cry Noah! I won’t ask to borrow a cup of milk for my recipe anymore! First I think, I love my snugly jammies…they’re so warm and soft. Then I wake up and realize, IT’S BREATHING ON ME! SURE IT’S SOFT, BUT WHAT IS THAT THING BREATHING ON ME? It’s all blue with a great big nose, talking funny, wanting to kiss me…that’s when I just lost it!!! A kid can only take so much! I wish this kid liked me!